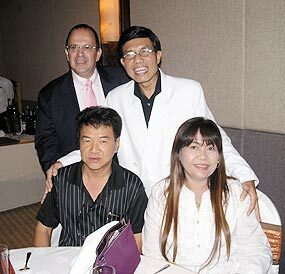 Amari “Baht for a better life” event goes with a swing! A delightful, delectable, delicious “Orange” night! Pink Panther entertaining the audience. Daeng Fantastic, looking great in his white suit, with some adoring fans. Could this be Thailand’s answer to the Three Tenors? Music for everyone at the Amari’s “Baht for a better life” concert. 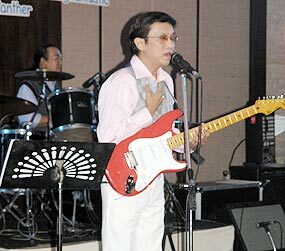 140 guests gathered on the evening August 30 at the Amari Rincome Hotel in anticipation of another great annual “Baht for a better life” concert and dinner. They weren’t disappointed – this year’s evening went with a swing provided by three different bands! The in-house favourite, Daeng Fantastic were of course there, and so were Pink Panther and Silver Sands. 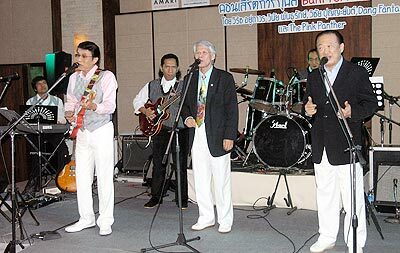 As all the musicians are good friends, a mix-and-match provided some great music, including ever-popular standards made famous by Frank Sinatra, Elvis and the Carpenters, plus less familiar but no less enjoyed classic Thai tunes. As a result, once everyone had finished their sumptuous 4-course dinner, they couldn’t wait to get onto the dance floor and lose some calories! The ever popular Wim Fagel, GM of the Amari, though, had other ideas – a surprise auction, featuring vouchers from other Amari resorts and hotels around Thailand, which raised over 100,000 baht for the charity, which collects donations from events held at all the company’s venues and from hotel guests and uses them to build and equip schools in poor areas. An amazing total of 275,716 baht was raised at this year’s Chiang Mai event, including an anonymous donation of 100,000 baht. Many thanks to go all who helped to make the evening such a success for the in-house charity, especially Oasis Spa, WOW Studio, ItalThai and the staff at the Amari Rincome. Over 80 enthusiastic supporters of the Rooftop Party Charity attended a very special sell-out dinner at D2 hotel earlier this month. 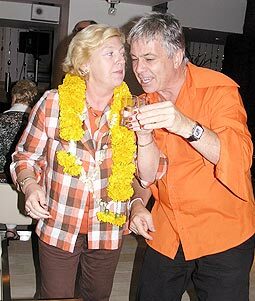 The theme of the event was “Orange” – at least 65 of the guests were wearing various shades of the cheerful colour – it’s just possible that the remainder were wearing orange underwear, but nobody checked! Birthday girl Jo seen here with Birthday boy John. Welcoming cocktails were presented on arrival, enlivening the usual meet, greet and gossip routine, until D2 staff led the guests into dinner with their “signature” dance routine! The meal was superb; the three-course menu including such delights as baked, stuffed chicken with prawn in green curry sauce with roasted chilli potatoes, and the choreographed march to remove and replace each course performed by the 15 waiters and waitresses caused much amusement. The evening was made even more special by the discovery that three birthdays and one anniversary were being celebrated amongst the guests – lots of congratulations and laughter followed. Many guests, including some who could not attend the dinner, stayed on for the D2’s regular DJ night, partying on with the help of orange and blue cocktails and non-stop dancing! Pictured is Tarun (left) from D2 making sure everyone has a good evening. 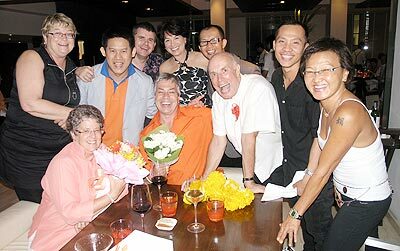 Birthday boy John surrounded by some great friends. The dancing went on well into the night! Many members of the expat community here in Chiang Mai, once they’ve settled in and dealt with culture shock and the novelty of being here, seem to feel that they need “something to do”. For native English speakers, a TEFL course leading to a teaching job is the obvious option – enjoyable and ultimately financially rewarding. Plus, the feeling that they’re, in a small way, helping. Once the TEFL qualification is gained, the fun starts…finding a suitable job, (often not as easy as it sounds on the web sites of the various TEFL training establishments), adjusting to Thai ways in the school itself, and actually managing to keep your job for more that one term, as many schools won’t want to pay you during the holidays! Expats fortunate, (and qualified), enough to be employed by one of the international schools here in the city should find their path to full employment, a work permit and a degree of respect smoothed to a great extent – those who are not so fortunate and end up working for a private school will soon learn to watch their backs! Another recent government-introduced hoop that ESP and TEFL-qualified teachers will need to jump through is the “Teachers’ Certificate,” or licence. This was the subject of an earlier act of parliament stating that all teachers should have the certificate as a minimum and work towards a full license within two years. Enforcement of this law has only recently begun. The short form takes 20 hours, and costs approximately 4,000 baht; the long form, (Teachers’ Licence), takes a whole year’s study and costs at least 60,000 baht, which rather rules it out as an immediate option, particularly as it does not seem to confer much in the way of benefits. Many private schools in Chiang Mai are now insisting that their native English speaking teachers take the short course, some, (the better ones…), are even paying for it on the teachers’ behalf! Confusion seems to reign on the internet forums concerning its content and its usefulness – its description as “Licensure of Professional Education for Foreign Teachers – Training on Thai Culture and Language, Professional Standards and Code of Conduct,” seems far too comprehensive for a 20-hour course. Surprisingly, however, teachers who attended a course held recently at Montfort College and run by the Private School Teachers’ Association of Thailand, found it informative, useful, and conducted in an effective manner by the course trainers, although the stated 9 objectives, would possibly take the average farang teacher a lifetime to fully appreciate! Presented over 3 days, the 8 modules were divided into 3 sections, Thai Culture, Thai Language, and the Teacher Licensure itself. Discussion forums formed an integral part of the course. The first topic, composed of three modules, introduced the basics of Thai society, and gave a useful, if brief, introduction to the country’s general history, societal foundations, economics, politics and religion, and included the differing aspects of the above as related to the four major Thai regions, the north, north-east, central and south. The country’s history was well-covered, going back to pre-history with the discovery of cave paintings and stone-age tools. Scant relevance to modern times or social development, maybe, but interesting nevertheless. Arriving at more recent times, the fact that, during the last 800 years, Thailand, unlike its neighbours, has never been colonised, was stressed as a “distinction”. Said “distinction,” it must be noted, has been used to explain, if not to justify, much in Thailand today. The political section of the module confines itself to an explanation of the set-up of government and the House of Representatives, a wise move under the present circumstances! The module concerned with Thai ways of life focuses strongly on the traditional social system and the Buddhist religion; the sub-section on the Thai social cycle and its influence on interpersonal relationships was particularly revealing. The concept of operating in at least three different “circles” – the family circle, the cautious circle and the selfish circle – not forgetting the all important concept of “loss of face,” surely must be one of the most difficult aspects of the process of Western adjustment to Asian ways. The second module involves Thai courtesy and manners, covering dress code, the physical aspects of Thai culture including public displays of emotion, the Wai, standing, sitting, casual versus formal behaviour, etc, etc. In other words, all aspects of body language, most of which are totally unfamiliar to foreign residents and therefore very difficult to interpret. A considerable stumbling block in the process of successful integration, unfortunately. The module continues with verbal and social etiquette, both language-based and general – again confusing to foreigners. An interesting sub-section is headed “Cross-cultural values,” and makes comparisons between assertiveness and aggression, seriousness and self-esteem, self-motivation and self-reliance, independence and individualism, etc. In the section regarding interacting with students and their parents, the teacher is advised not to “sit or stand on class books,” amongst other unlikely modes of behaviour! The final module of this topic includes a basic and well written list and description of Thai arts, music, dance and festivals, historically based by period and area. The second topic concerned the Thai language, and, again, is a good basic guide to simple and useful aspects, including phrases, tonality, pronunciation and a section on the Thai national and royal anthems. The final topic extensively covered laws and regulations for teachers and standards of professional knowledge and experience. 4 modules were included; an introduction to the relevant Teachers’ and Education act, a description of standards of professional knowledge and experience, standards of performance and standards of conduct. On this last, teachers were heard to gently remark that a similar section for students might be an excellent idea! Although the requirement of a teachers’ licence seems to have been greeted by a less than enthusiastic response within the ESP community, the general feeling of the 120 teachers who attended the course was encouragingly positive. Having seen, and been impressed by, the accompanying course book, this writer considers that the information it contains would be of use to all newly-arrived expat residents as well as to teachers. Attendees receive a certificate at the end of the course, it remains to be seen whether this is of any value at all in gaining or keeping a teaching job in Chiang Mai private schools. September 18 As part of the International Song Festival, Antoine Garth will be giving an informative and entertaining Lecture Recital entitled “The development of the Renaissance Motet” at that very individual restaurant and bar, the Spirit House. Musical examples will be provided by Antoine himself and his talented local volunteer group, the Early Music Ensemble. Examples will include music by early composers such as Josquin des Pres, Tomas Luis da Victoria and Giovanni Pierluigi da Palestrina. The Spirit House restaurant, if you haven’t already visited yet, is a treat in itself, atmospheric and very individual, decorated with wall hanging and antiques and with a huge spirit house (of course) as the backdrop to the stage. Its convivial owner, Steve, will be providing a Renaissance Supper to match the music. Tickets are 600 baht, available at the door, and the evening starts at 6.30. The restaurant is located on Soi Viengbua, Chiang Puek. September 19 – Please note that the piano recital by Andrew Wilde on this date has been cancelled due to health reasons, as have his master classes. Andrew was due to fly in from the UK; sadly, he has developed a severe ear infection and has been advised not to fly. We wish him a speedy recovery and hope to see him here at a later date. September 20 If you’re ready for another night of classical delights, this is also for you – the second in the series of Bennett Lerner concerts focusing on the great French composer Gabriel Fauré’s Nocturnes and Barcarolles. Chiang Mai’s own Bennett Lerner will be joined by Dutch Tenor Jan-Ate Stobbe, who will perform Gustav Mahler’s “Lieder eines Fahrenden Gesellen,” (Songs of a Wayfarer) and operatic arias by Verdi and Tchaikovsky. The concert begins at 7:30, and is being held at Payap’s Saisuree Chutikul Music Hall on Mae Kan campus. Tickets are 200 baht. For more info, call Nok on 081-804-3920. For more information, contact Steve at Spirit House 084-803-4366 or Antoine at [email protected] gmail.com or 085-225-2169. September 24 This month’s meeting of the ever-popular Expat Ladies’ Lunch Group will take place at the Chez Daniel Restaurant Français, beginning at noon, and featuring a three course delicious meal including soup, main course, and dessert, plus tea or coffee for under 200 baht! A vegetarian meal can also be ordered. While you’re there, you can also buy wonderful pate, sausages, ham, etc, to take home! Chez Daniel (French/Normandy cooking) is located at 255/19 Superhighway Entrance off Chiang Mai Land Road, not far from Airport Plaza. Please contact Fran DaCosta by email on [email protected] to make a reservation or for details of the menu. 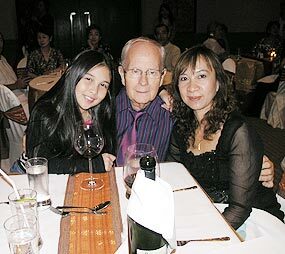 September 28 Antoine’s very busy this month – his International Song Festival presents “5th Avenue meets the Cotton Club” featuring the songs of Cole Porter and Duke Ellington at the Shangri-La Hotel’s Concert Hall starting 6:30 p.m, with a buffet dinner after the concert at 8 p.m. He will be joined by Thanawat Kapanyoo, guitar Siraphop Sitson, bass and Arnuparp Khumma, drums. For those of you who missed the first performance earlier this year of this great Jazz evening, don’t miss this one! Tickets cost 200 baht for the concert; 550 baht for concert and dinner. It truly will be a great evening. For information and reservations, contact Antoine at [email protected] or 085-225-2169. 20th Sept Chedi Brunch-Lunch: noon till 3 p.m.; 750 baht includes 1st drink. 26th Sept Holiday Inn, seafood buffet from 7 p.m.; 600 baht. There will be 20% discount on Drinks.